Affordable Accoutrements: Room Service, for Two! Today we're in the coziest of the guest bedrooms. It's called the Blue Room (original, no?). I've set a table for two next to the windows and temporarily repurposed a circa 1950 Grundig entertainment center as a sideboard. My neighbor gave it to me several years ago when she went into assisted living. She and her husband had brought it back from Germany in the 50s and, after numerous moves, she took pride in the fact that it didn't have a single scratch on it. It still works, by the way, shortwave radio and all. It now serves as a surface on which a lamp sits and a few decorative objects can be displayed. I think it's nice to always provide overnight guests with a horizontal surface to use while unpacking, dressing, and so on. The champagne/tall sherbet glasses are Candlewick (1936-1984) by Imperial. It was one of Imperial's most popular patterns. While the Candlewick serving pieces appear delicate with their beaded rims, they must be amazingly durable. I see Candlewick pieces in almost every antique shop and mall, and they're generally in excellent condition. HERE's a link to an eBay guide on telling the difference between genuine Candlewick and imposters produced by other companies. I love the simplicity of the beaded stems. They feel nice in the hand while reflecting light and color beautifully. The old iron bed was my paternal grandfather's. When my father was a child, he recalls that my grandfather always kept a loaded revolver in a holster on the bedpost (at the head of the bed) with a shawl draped over it. The shutters provide privacy and darken the room nicely for guests who sleep late. My mother made the hand-stitched butterfly quilt when I was a child. On the top shelf, simple sterling candleholders (estate sale, $5). A biscuit jar sits on the second shelf. The marks on the underside of the lid appear to be English (Jackie?). I'm not sure how old it is. It was a gift long ago from a former teacher of mine, who dabbled in antiques. She coached me in my one attempt at participating in a public speaking competition. I'm definitely not an orator, but I somehow won the contest. Obviously, she was an outstanding instructor! On the third shelf is a Candlewick mayonnaise bowl and underplate. I grew up seeing it in our home, but I don't know how it ended up there. It probably belonged to one of my great-aunts. I wish I'd paid more attention to things like that. Believe it or not, there was a time I had almost zero interest in antiques/"old stuff." 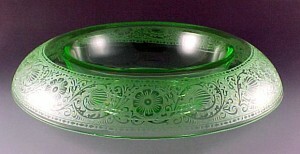 Below that is a Lenox bowl. It's made in the USA. Many Lenox vases and other decorative items are made in China these days. I sometimes use it to hold flowers for a centerpiece. I think I paid around $6 for it at Goodwill. I remember the young woman at the checkout was horrified at the high price. I told her it was OK, that I liked it enough to pay that amount for it. The china is Monroe (1983-2003) by Lenox. It's from the Presidential series. I consider it my "primary" set of company dishes. I haven't taken inventory lately, but I've added to the basic set through the years. There are 20+ place settings, with lots of serving pieces. The azaleas are in bloom! There were only a few today, so I cut off just the very tips of branches and displayed them in a simple silverplated epergne. The little vases are detachable for filling and cleaning. It's normally displayed in the corner on the shelf where the mayo bowl is sitting (it visually fills the space better). I gave it a quick, much-needed polishing before I put it on today's table. View from the chair on the right. The daffodils have been beautiful this year, but they're finished blooming now. The hostas are rapidly emerging, and their leaves are unfurling. As you probably know, daffodils and hostas make good companions, with hosta leaves concealing the spent daffodil foliage as it feeds the bulbs to prepare them for next years blossoms. The flatware is King Cedric, introduced by Oneida in 1933. There's a 1949 version of the same pattern in sterling. I mix the plated and sterling pieces and honestly can't tell the difference without turning it over to read the description. The pieces below have special meaning for me. Their value is strictly sentimental. The dinner plate was my maternal grandmother's, and I remember seeing it displayed in her kitchen. The Lord's Supper tray is a Goofus glass piece (early 20th Century pressed, decorated glass) that belonged to my paternal grandparents. When I was a child, I assumed it had been clear, and someone (my grandmother or my father's sister) had painted it gold. You can read about Goofus glass HERE and see some stunning examples of it HERE. More azaleas on the "sideboard." The water glasses are Fostoria Heritage (1979 - 1982). They're from an estate sale (of a former US Congressman from West Tennessee). The tall champagne flutes are an unknown pattern from a consignment shop). I think it's thoughtful to provide a chair, even a small one like this, for guests. It's nice to have a place to sit while putting on/taking off shoes. Or sipping a nice cup of afternoon tea or coffee. The cups and dessert plates are waiting to be used after dinner. The Monroe creamer and sugar, with a Fostoria Colony double light candleholder in the background. I really like the shape of these cups, as well as the cream background color and the gold decoration on the handles and base. This heavy crystal decanter's a recent purchase from an "upscale resale" shop. It was only $10. It had a slight rough spot on the edge of the rim, but I smoothed it with a file (from a beauty supply store). I don't think anyone would ever be the wiser. The silverplated covered vegetable dish came from an estate sale ($5 on day 2). The extra-tall etched wine glasses were a Goodwill find at $1.99 each. Both tablecloths were purchased at closing time on the last day of an estate sale. I'd be embarrassed to tell you how little I paid for an armful of beautiful vintage table linens that day! My grandfather's one of the commissioners photographed on the steps of the County courthouse. I remember seeing him walking to his car dressed in a suit and tie on his way to hospital board meetings, never without a hat (tilted slightly ... just so). "A fly wouldn't light on him!" I used to hear said (of him) when I was a child. Is that a Southern expression? I'm not sure, since Southern is all I really know. The made-in-Italy glass charger plates are from a local junk store. $2 for four. Silverplated coffee pot from an estate sale. 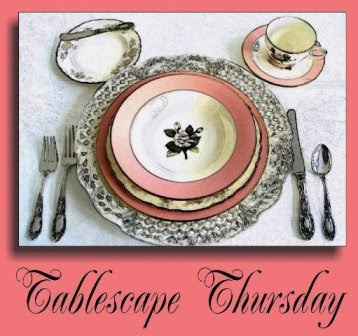 It's time for Tablescape Thursday with Susan of Between Naps on the Porch! 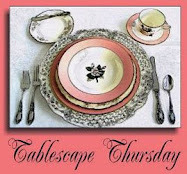 Stop by and see what Susan and her talented tablescaping friends have been doing this week. Click HERE or on the image below. Today, April 14 , 2010, is the last day to leave a comment on "Day into Evening Table, with April Cornell Giveaway" to have a chance to win a bundle of four beautiful April Cornell blueberry napkins. Click HERE to see that post. Thank you! So welcoming and serene- really lovely. Funny, we posted about a meal in my bedroom too, but it was a simple breakfast. I would love to stay in that room! I love the shadows on the wall in the picture of the flowers in the silver vases. Thanks for all the ideas of the thoughtful touches you provide for your guests! The treasures from your family really add interest to your post and make the room feel 'homey'. I want to install shutters in my bedroom to darken it more like the ones you have in your bedroom. Love that room. 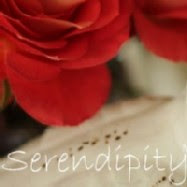 You post such great pictures and I really enjoy your blog. This would make the most discriminating guest delighted! Just lovely, Bill! Love this meal in a bedroom. Very intimate! What a beautiful room; made even more beautiful by that fabulous table! I would love to stay in such a room. You have so many wonderful things from your family; both stories and dishes! Such a lovely, romantic setting! Your mother's quilt is a wonderful treasure! Thank you for the information about the crystal. I will check out the link! Bill, Any guest who would stay in this room would move in for good! So beautiful and a nod to a day gone by full of gentle civility! It spins a story all of it's own. Your pieces are so elegant and well put together! I just love silver so your epergne makes me swoon! The azaleas look so lovely in this one-of-a-kind piece! Your king Cedrick flatware is a real treasure. I love the bottoms of the handle! And I can just imagine pouring a cup of coffee from this beautiful silver coffee pot with the wonderful detail. The room, bed (I have an iron bed like this in one of my guest bedrooms), furniture, windows and treatments and this beautifully laid table are magical! Wonderful post, Bill! I have tarried a long and wonderful while! Beautiful! Love the silver coffee pot! Oh Bill....may I come stay the night? What a wonderful room set up for guests! Everything is so beautifully appointed. You've thought of everything a guest could possibly need. Is the Monroe china the one that is burgundy or blue? I can't remember & can't tell in the photo, either. My friend Nicole & I were just talking about that pattern today. She has the burgundy in the Presidential series. She is going to let me do a TT with her dishes soon. As always, your knowledge of the subject matter is impressive & I never leave your blog without being both inspired & educated. Thank you! I so look forward to your posts. This one is just as breathtaking as the others. Thanks for the close up photos of the china. It is amazing. What an elegant pattern. Everything is so lovely, and I appreciate the information you always include. Hi Bill, it's nice to see how you decorate the rooms and the tables with so much empathy and taste. You really appreciate the beauty of all these things and you have expertise to this things and that makes the special touch of your tablescapes. Very Lovely Mr Bill as always. How pretty -- what a lovley room for your guests to stay. I didn't know about the hostas with the daffodils -- I was sorry to see mine "spent" this week. But loving the azaleas bursting in blooms. Oh, forgot to say...I love that darling tussy mussy holder...so cute! What a lovely way to enjoy azaleas. In my area they bloom around Mother's Day each year. I must think of them as a wonderful "cut flower" for the house. Wonderful pictures ... you've captured the room beautifully. Bill, This is lovely, as always. I especially like the beaded stemware. The room seems so cozy and charming with the added elegance you bring to every table you do. I always enjoy visiting here! Enjoyed your post, the personal info and your photos are fantastic! I really love that tri-leveled silver vase most of all. Would love to be a guest in your house if this is the treatment I could expect. Very nice! This room and the tablesetting is lovely, as always. Your guests must feel so welcome. It was nice to see your Candlewick. I have 4 packing boxes of Candlewick which belonged to my grandmother...probably purchased in the late '30s. My mother had it in her cabinets from the late '50s. There is everything from all styles of glasses, plates, punch set, platters and vases...Now I am looking for a cabinet to store it so that it's accessible. Well you have outdone yourself again with a fabulous and inviting table! Just beautiful!! This is a delight to see your tablescape in the Blue Room. So nice to read about your special keepsakes. Wonderful pictures to highlight your post. You have hit the jackpot on your treasures. Appreciate you sharing them with us out here in blogland. What a beautiful room! I'm sure you have a hard time getting rid of your guests, LOL! How special to have items that used to belong to your grandparents and that quilt that your mama made. Thanks for sharing. What wonderful memories -- great stories! I could move in. It's truly a beautiful room. Once again a very elegant setting! I never thought to use my azaleas as cut flowers inside. They look so pretty. I'm going to cut a bunch tomorrow and bring inside. Thanks for the tip. I remember seeing similar biscuit jars in lots of houses when I was growing up so I think you are right about it being British, also we used to make beautiful china here, but sadly lots of the factories have closed down. I love the Italian glass chargers, a great bargain, also the linen that you bought. As you know I am collecting linen tea napkins for my 6oth birthday, but I have paid quite a price for some of them. Great that you did you tablescape in the guest bedroom, I like to see the different room settings. Love the bed and your mother must of been very good with her hands and patient to make that wonderful quilt. Great post, thanks for sharing, very best wishes, Jackie in UK!! Beautiful room, and a delightful table setting. Your guests are VERY lucky people! Just beautiful, you always come up with the most inviting displays. RE: your Grandfather. Gotta love those Southern Gentleman and their hats. Brings back many pleasant memories of those by gone days. It is nice that you have so many family mementos to mix in with the other pieces. Real treasures. It must be a real treat to be a guest in your house. Bill, what a fabulous design. I too love the simplicity and grace of the beaded stems. I have just painted my den/office that wonderful blue shade. Love the coffee pot, is amazing!!! Beautiful pieces for an interesting idea to set a table in the bedroom. What a visual feast, as usual. I love reading about everything in the room and it's history. Your photographs are wonderful--I feel like I'm there! Love how you always fade into the evening with the twilight and candles. So nice to see a new post from you filled with your fabulous finds and gorgeous photos! Bill, as always this table is beautifully presented in every detail. It's fun to see the family pieces that have been handed down to you. It's fun to use those kinds of treasures in one's home. The King Cedric flatware is understated elegance and just the kind of flatware that calls to me. The glass chargers unusual, beautiful, and a great bargain. How do you do it time and time again? You find the best treasures! The blue guest room looks to be a charming spot. Your guests may not want to leave! Another great post and love the guestroom and all the memorable pieces it contains. Beautiful table! What lucky house guests you have. I especially enjoyed the family pieces with sentamental value. Also loved the epergne and the silver teapot - I have a weakness for anything silver. Well staged, as always. Please do stop by and see our urban tables. -- Jane F.
Antiques, shutters and ohh... well... every piece & inch of your room is more than perfect. Beautiful post, Bill. It just doesn't get any better than azaleas and silver in a blue bedroom for me! Love the picture with the sunlight casting shadows from the flowers on the wall! I've been polishing my silver ~ come take a look at my new wall grouping! I especially loved the azaleas and silver against the blue walls! China is beautiful too. How sweet you included a shot of your Mother's quilt. Would love to see more sometime. I think I would have enjoyed your Mom! It would be great to be a guest in your house! Who wouldn't want to be a guest in that inviting room? Love the epergne! Oh, your guest room looks so welcoming. I would love to sit there for dinner. I can't begin to tell you all of the things I like. Love the china, and the crystal and the silver, lol! But the flatware is divine. You always do such an impressive job with your tablescapes and your story telling. I am envious of all of those vintage linens! The silverplated coffee pot is to die for. And I too, love the candlewick pattern. I have some candlesticks in that pattern; I never tire of them. It's great to see the Lenox Monroe china. I selected Lenox Monroe crystalas my wedding crystal and I show theh Lenox Monroe crystal water goblets in this week's tablescape. I also like the way you pamper your guests-with a place to unpack, sit down and take their shoes off. When I stage homes or work with clients, I always talk to them about the "essentials" of a good guest room. You dinnerware and coffee pot are exquisite. The silver flatware also. Of course your tablescape never disappoints me. You are so talented, Bill! And now I find out that you are good in giving speeches too? Is there anything you can't do? This beautiful setting transports me to one of my favourite places in the world - Paris. In my less busy days, I would jump on the Eurostar train in London, Waterloo and arrive at Le Gard du Nord,Paris just over two hours later. Along the train journey, I would see the most beautiful things. Misty lakes with swans gliding along in a silent ballet, pretty blossoms blushing at me as I admired their colourful petals, butterflies flitting around full of charm. I love this setting,it is just so Parisienne! Beautiful, china, silver and narrative...What did we eat?? Nothing red or chocolate that may stain the carpet I hope! As for that expression, I don't know...I am Yankee! Another beautiful tablescape. I love the stemware and the silver is gorgeous. Aren't memories great? I have started poking around some shops and eBay and have found some Fostoria and Tiffin (not at the bargain prices you find) and I am very happy to have it. I am planning a tablescape. Again, wonderful and educational post. Its all been said .. Fabulous and a dream room that one could only hope to spend a night in..
Everything is so beautiful. Thank you for sharing your guest room and lovely things with us! What an absolutely delightful, charming room!! So many pieces with so many memories attached. That is what truly makes a house a home.